Recently I found another great natural toothpaste for review. 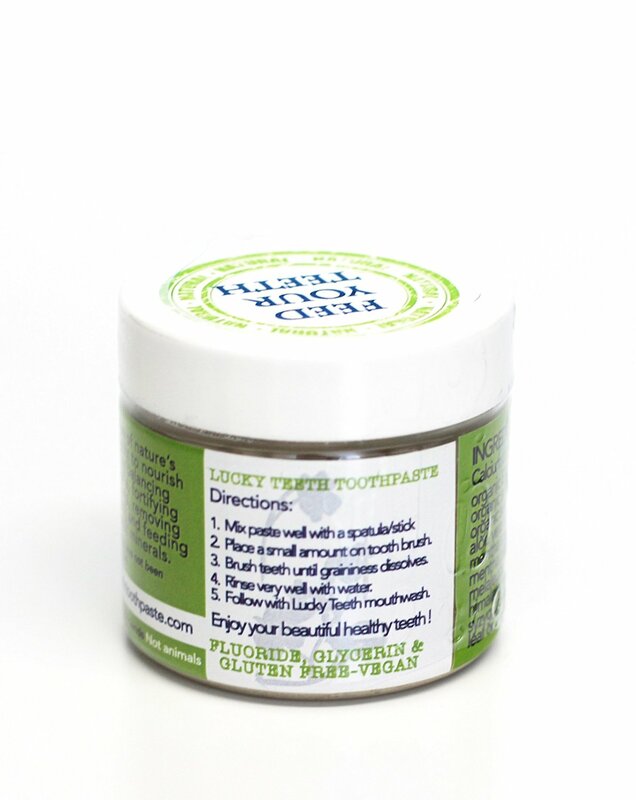 Lucky Teeth Organic Toothpaste is a great product that comes in a jar. We already had several great toothpaste solutions that were packaged in a jar. So maybe this is a new trend, placing a great natural toothpaste in a jar. I have checked all ingredients on the list, and there are no major problems with it. It doesn’t contain any questionable ingredients like fluoride or SLS. As well it is free from preservatives, artificial colors, and flavors. Lucky Teeth guarantees there are no hidden ingredients and that this toothpaste is vegan-friendly and no tests were done on animals. Organic peppermint and organic spearmint will make your breath fresh for an extended period. But this toothpaste contains some exotic ingredients like oregano oil, organic cinnamon oil, organic tea tree, organic aloe vera, organic sweet almond oil, and organic sunflower seed oil. With so many organic oils it is normal that Lucky Teeth Organic Toothpaste costs more money than some regular conventional toothpaste. Lucky Teeth Toothpaste has quality ingredients, and that makes this toothpaste a number one natural and organic toothpaste on the market. To keep the toothpaste in a usable state, you need to hold it at the proper temperature. If you keep it at a low temperature, it is possible that it will get solid and you won’t be able to use it. Also, you need to use a pea size on the toothbrush; it is not necessary to use more. This product is expensive, and it contains luxury ingredients we mentioned above, so it is not needed to use the big amount on the toothbrush. Toothpaste will probably not foam too much in your mouth since it is mainly made from oils and does not contain foaming detergents like sodium lauryl sulfate. Some people are scared of sodium bicarbonate. They are scared that it will hurt their enamel or that they have too sensitive teeth for sodium bicarbonate. But the truth is different, sodium bicarbonate can’t damage your enamel, it is not hard enough to hurt enamel. But if you use too much sodium bicarbonate and use it in significant amounts every day then your mouth can get alkaline. You should keep PH neutral balance in your mouth, not too alkaline, but as well not too acid. Lucky Teeth Organic Toothpaste is maybe expensive toothpaste, but you need to know that this toothpaste contains lots of organic oils and if you check the price for each of that organic oil you will see that these high-quality oils cost money. This toothpaste is ideal for people that want to use 100% natural toothpaste without problematic components like artificial flavors, detergents, preservatives and other chemicals that don’t belong to toothpaste. If you have money and want to use the top quality product, then you can buy Lucky Teeth Toothpaste, but if you are short on money, there are alternatives. You can get Uncle Harry Natural Toothpaste or Coconut Oil Teeth Whitening Toothpaste, both of them are great natural products that will help your teeth.